Atlanta Convention & Visitors Bureau (ACVB) continues to lead the way in the meeting industry with the introduction of its new suite of virtual reality site tour products for meeting and event planners. The enhancements to ACVB’s existing virtual reality applications, which launched August 2016, now include three new itineraries to appeal to both attendees and planners. Each itinerary follows a storyline for different experiences and types of events. Of the three new options, users can experience a mock site visit, explore the Georgia World Congress Center Authority campus and its surrounding after-hours entertainment or visit five distinct Atlanta neighborhoods. 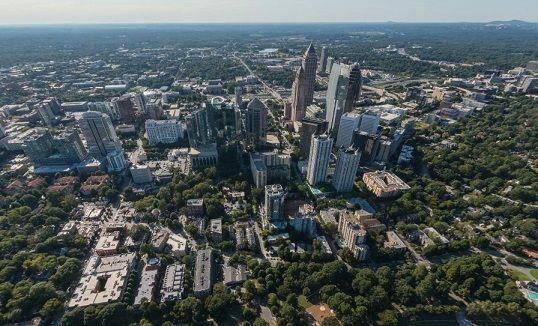 Spots along these tours include the Midtown Mile, Westside Provisions District and an aerial view of Centennial Olympic Park. The experiences are viewable with virtual reality goggles, such as the Samsung Gear VR, as well as being compatible with Google Cardboard and can be downloaded for free on Apple and Android devices. ACVB also developed a version of the app that can be used on any iOS or Android phone without the need of the additional external viewer. Sales managers now have the ability to curate, annotate and guide the tours via a companion tablet app while a customer is viewing the VR tour with a headset. This development allows VR to be utilized in a sales context as it depicts where the customer is looking while they are interacting with the virtual tour. Combined with the ATL360 Virtual Tour on AtlantaMeetings.com, ACVB created an entire set of tools in partnership with 100 Creativity Digital to incorporate digital innovation and convenience into the sales and meeting planning process.